Trim the steaks of any excess fat and gristle. Leave them to come up to room temperature. Heat the oil in a deep-fat fryer to 120°C. Place the cut chips in the basket and blanch until they are completely soft. Remove them from the basket and drain on kitchen paper. Turn the fryer up to 180°C-200°C. Soften the butter and mix it with the soft blue cheese. Season to taste and add the sherry vinegar and parsley. Place the butter on a sheet of cling film. 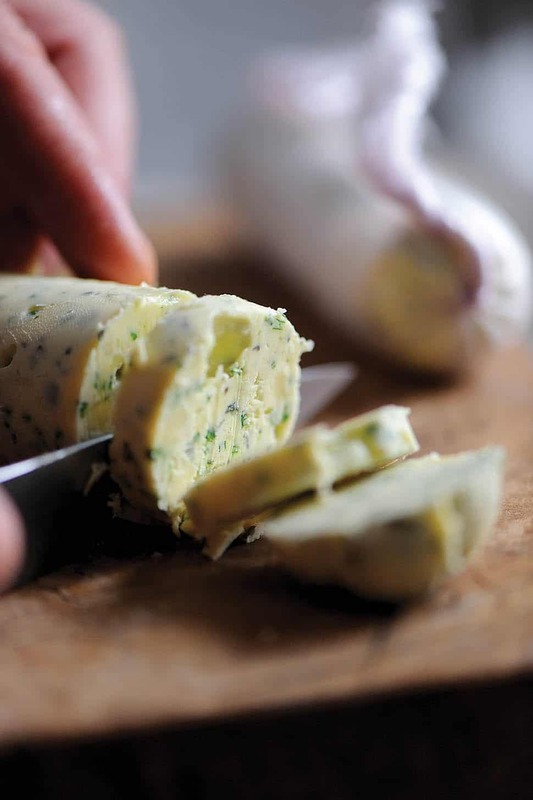 Roll into a cylinder the size of a £2 coin and set the butter in the fridge. Take a shallow, wide-bottom saucepan; add a little water and a knob of butter. 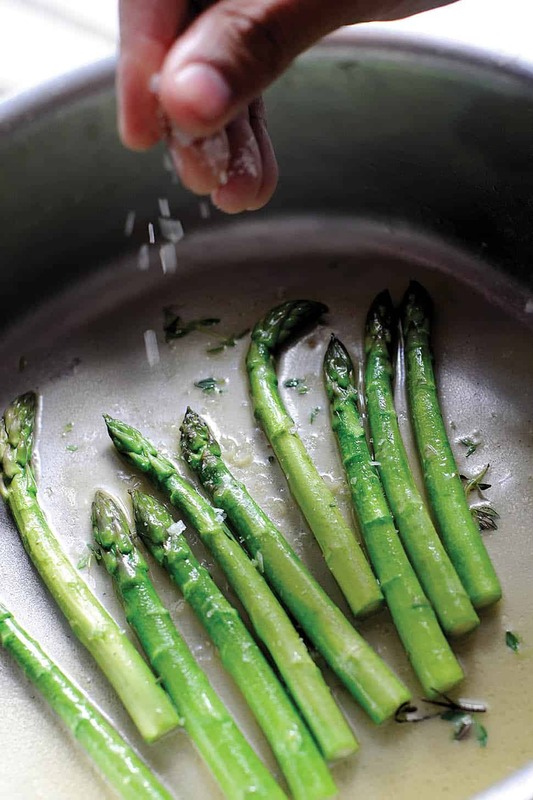 Season with salt and pepper and add the asparagus to the pan. Shake the pan occasionally to roll the asparagus – the water and the butter will thicken and coat it. This process will take about 3 minutes. Leave the asparagus in the pan to keep warm. Heat a large frying pan. It needs to get really hot and should accommodate the size of the steaks. Add a little vegetable oil to the pan when it starts to smoke. Season the steaks with salt and pepper and add carefully to the pan. Do not shake the pan or move the steaks until the first side is caramelised. Turn the steaks over and do the same again. Add a little butter to the pan and allow it to turn nut brown. Baste the steak and cook according to preference – medium-rare should take about 4-5 minutes from the steak going into the pan. Lift the steaks out and rest for at least 10 minutes on a rack with a plate underneath to catch any juices. After 5 minutes of resting, turn the steak over and rest for another 5 minutes. Return the chips to the fryer and cook until golden and crisp. Drain, season and divide between the plates. 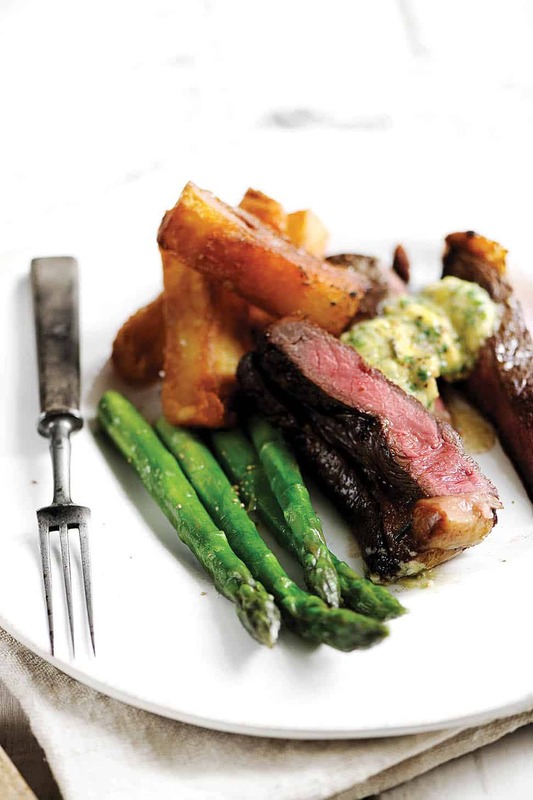 Serve the asparagus next to the chips. Slice a piece of the chilled butter on each steak. Warm the steaks through in either the oven or grill to lightly soften the butter.